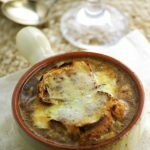 This super delicious Vegetarian French Onion Soup is rich, decadent, comforting it is all you need to be warm and cozy during this winter. We replaced the traditional beef broth with a rich mushroom broth which made this Vegetarian French Onion soup simply irresistible. Slice baguette in 1/2 inch rounds and toast until crunchy. The soup base can be made ahead of time, add bread and cheese and bake just before serving.